Just because the Higgs has been discovered does not mean there is any rest the the physcists at the LHC. They are now a few days out of the technical stop and have already returned to running with maximum bunch numbers (at slightly reduced intensity for now) and have added 0.33/fb, and they have done some special runs for TOTEM. Are unofficial Higgs Combinations “Valid” ? The Unofficial Higgs Combination Tool has now been updated with all the new Higgs plots released in the last few days, including the Tevatron updates and the new 8 TeV data from the LHC. There will probably be more to add on 7th and 9th July from ICHEP. Feel free to play around with it. I agree with what he says. The unofficial combinations you find on this blog are approximate and unofficial and should be used with caution. I have always made that clear. It is not just the correlations that are neglected. The quick combination method assumes that the statistical errors have a flat normal distribution and that is not quite correct. The detector collaborations don’t provide detailed likelihood data to outsiders so this is the best I can do. Luckily all statistical errors tend towards the normal Gaussian as the quantity of data increases (central limit theorem) and in most cases there is enough data for the results to be good, with a few exceptions. Whether the combinations are “valid” or not depends on what you are using them for. I don’t consider them valid for writing up published results of any kind, but they are good enough as a rough guide to theorists looking for possible signals in the data and there is nothing wrong with showing them at conferences as some eminent theorists have already done, provided they come with appropriate caveats. I have previously shown some comparisons between official combinations and my unofficial ones to show how accurate they can be (or not). I think it is worth doing a few more now using some of the recent results where the amount of data has increased. In all the plots below the red line is the official result and the black is the unofficial. 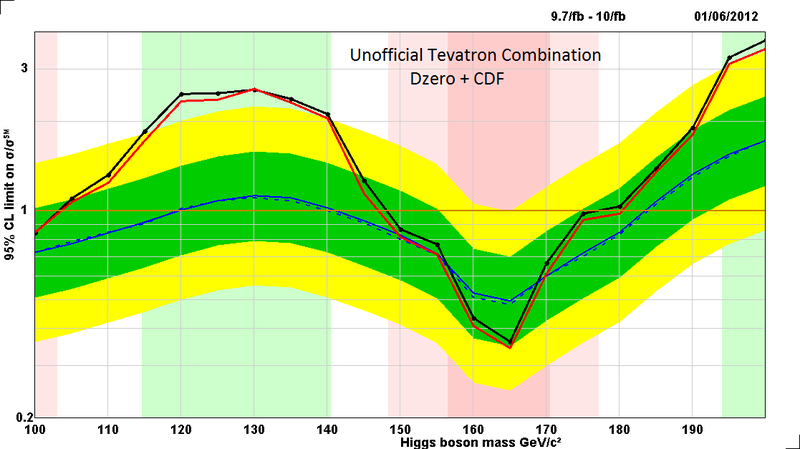 First up is the latest version of the Tevatron combination compared with an unofficial combination of the updated Dzero and the latest CDF plot that was updated in March. You can click on the plots to get a larger version. The combinations across all channels have always worked quite well because they use lots of data. 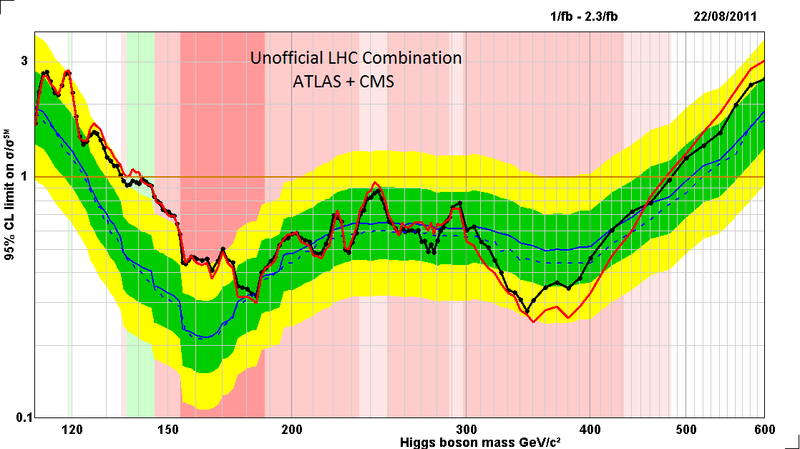 The last time that the LHC provided an official combination for ATLAS + CMS was in November when there was only 2.3/fb. here is how it looked next to the unofficial combination that I had done 10 weeks earlier. Notice here how the accuracy gets worse at higher energies where there is less data available. Heuer seemed to be implying that there should be another combination due out soon. If so it will be interesting to see if the comparison improves as I would expect. The combination across ATLAS and CMS should be better because it involves twice as much data. They should also have twice as much again by the end of the year so by then combination should work OK even in this channel. If you want to try more the Higgs combination tool is easy to use and free. Update: I said that I dont think these combination methods should be used in published papers but other theorists are apparently not as reticent. arXiv:1207.1347 is one example of paper showing a combined signal plot as well as combined channel values and other fits. There conclusion is that everything fits the standard model except that the diphoton rate is 2.5 sigma too high, in agreement with my figure. 4th July : CERN give their important update and possible discovery announcement followed by a press conference. This may just cover the most critical channels (e.g. diphoton and 4-lepton) Webcast from here. 7th July: The Higgs results for each decay channel in fine detail will be presented at the ICHEP conference in the parallel sessions. Most of these will be updates with 2012 data. I am informed that one stream of talks will be webcast live from ICHEP for 5th-7th July and this will include the Higgs searches. Link to come later. 9th July: The combined Higgs results from CERN for ATLAS and CMS (separately) will be presented in the plenary sessions at ICHEP. This will again be webcast. The Large Hadron Collider has now entered a Machine-Development/Technical-Stop phase that will last eleven day. That means they have collected all they can for the ICHEP conference in July. The amount delivered is 6.6/fb, just a shade short of the projected figure of 6.8/fb and well over the 5/fb target, so they have done very well. As usual it was not easy with many problems holding down run efficiency but in the last week they amassed an impressive figure of 1.3/fb to make up for some time lost at the beginning of this run. They have two more runs of similar length to the last so they are well on the way to reaching the 13.3/fb figure that was given as the amount needed to ensure that both experiments can independently discover or rule out the Higgs Boson. They should also have time to complete other priority tasks before the long shutdown next year, such as testing runs with 25ns that will be needed when they restart at 13 TeV. Now it is over to the experiments to see what they can achieve in time for ICHEP which starts in just 15 days time. ATLAS has recorded 6.23/fb and CMS has 6.15/fb and they have already been beavering away with the first chunk of this data. There is some chance that they can get to the critical 5-sigma level for independent Higgs discoveries (For the (well-meaning) nit-pickers I mean discovery of a neutral boson resonance (probably) consistent with the standard model Higgs, sigh) Contrary to what some blogs are saying it is no more difficult to combine the 7 TeV and 8 TeV data than it is to combine all the different channels, and whether or not they do this could be largely a political choice depending on how and where they want the discovery announcement to be made. However, time constraints could also be critical. It will be tempting for them to try to use as much of the 6/fb of data as possible for the Higgs search but that will require maximum computing resources. They may have to face a difficult choice between getting discoveries in the Higgs search in time for ICHEP or looking for other searches for more exotic physics. If it comes to that face-off my bet would be on them prioritising the Higgs search, but whatever the outcome it will be an enthralling conference. 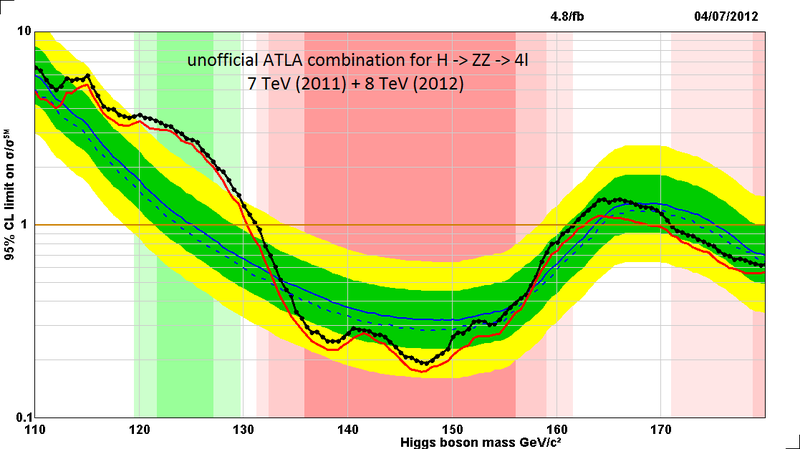 I should also mention that LHCb have 0.65/fb added at 8 TeV so good progress there as well. By the way, viXra Log has made it into the final of this years science blog contests at 3 Quarks Daily. It is up to Sean Carroll to pick the three winners. Now I wish I hadn’t said all those bad things about him, perhaps he didn’t notice, LOL 🙂 . In just three weeks time ICHEP 2012 will be underway with the biggest expected news to come from Higgs Searches presented on 9th July in Melbourne. Meanwhile closer to home a much more low-key meeting at CERN has given us an update on the running of the LHC. As far as I can tell from the images of the auditorium the only people who attend these meetings in person are the speakers, but there are high quality webcasts so nobody else has to. Myers also reported a scary story about a situation that nearly led to LHC armagedon last week when they discovered in testing that the beam dump system relied on a power supply that formed a single point of failure. A simple fault could have led to a situation where the beams could not be dumped even when a failure signal would normally abort the run. The beams would have kept circulating like an unstoppable train with the only possible outcome being the loss of 120 MJ of beam energy around the accelerator ring with the potential to destroy almost anything and everything in the collider. 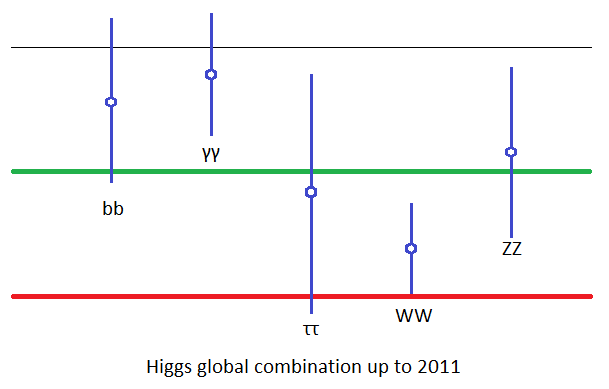 The progress talk from ATLAS is also interesting in that they revealed three new versions of Higgs plots using 2011 data with improved analysis methods. From this I deduce that at ICHEP they will update only the critical digamma and Z to 4l channels with 2012 data and will use these new versions of the 2011 data for some of the other channels. These will be combined to form the new ATLAS plot. Although the cut-off for collecting data for ICHEP has passed I think there is a good chance they will continue collecting up to the technical stop because the collection rate is now very high. This may give them close to 6/fb of data in the two high-resolution channels. In the ICHEP abstracts CMS indicate that they will update all their channels with 2012 data. This difference between the two experiments is similar to what was presented at the December council meeting. As far as I know there is no technical reason why the two experiments should not combine all the 2011 data and 2012 data in the high-resolution channels in time for ICHEP, but this would risk arriving at the unfair situation where one of the two experiments gets the discovery level significance first. I think there is a good chance that they will compare preliminary results in the next few days and if it is clear that they can both reach the critical 5 sigma level they may go for full combinations and announce the joint discovery. Whether they can do this depends on how much data they use, how well they deal with pile-up, how well they control the background, how lucky they are with the fluctuations and even how big the cross-section is if the Higgs is seeing BSM enhancements. My prediction is that they wont quite get there this time round, however an unofficial discovery using ATLAS+CMS is much more likely. Apart from these Higgs results there will be a lot of other new results presented at ICHEP including a few exotic searches (such as heavy gauge bosons) using 2012 data from both ATLAS and CMS. I expect ATLAS to hold their 2012 supersymmetry searches back for SUSY 2012 in August but the abstracts from CMS indicate that a few new SUSY at 8 TeV will be shown at ICHEP. LHCb, Tevatron and many others from the accelerator labs, neutrino experiments and astronomical observatories have the potential to produce new discoveries in particle physics and ICHEP 2012 is the place to grab the headlines so we should expect the unexpected. If you have not yet voted in the 3 Quarks Daily science blog awards viXra log would appreciate your support. Update: voting is complete and we appear to have made it through to the next round in about 9th place with 68 votes. Thanks. The Large Hadron Collider crawled out of a scheduled technical stop two weeks ago and passed through a rocky patch. There was a series of cryogenic failures that slowed the build up back to normal luminosity. They are currently running with the worst hit sectors around point 8 at a temperature of 2.0 Kelvin rather than the normal 1.9 K. This appears to have fixed the problem but as an uninformed outsider I can’t help wondering what extra risks this entails. Another issue was emittance blow-up from the SPS that was limiting peak luminosity to around 4.3/nb/s. This was fixed in the last couple of days and now luminosities have returned to the record levels set before the technical stop of around 5.7/nb/s with bunch intensities up to 138 billion protons per bunch. previous discrepancies between luminosity recorded by CMS and ATLAS have been resolved by data from the Van de Meer scans run just before the technical stop. The two experiments are now in perfect agreement and previous record numbers from CMS have been rescaled downwards. The present luminosity should be close to the maximum they can achieve this year unless they have kept back some tricks for later. On the plus side, minimum turnaround times are well under two hours which is about half last years waiting time. Recovery from loss of cryogenics also looks much faster than before. This means that if they can avoid problems with cryogenics and RF they should be able to accumulate data at a high rate. As I write they are passing the 2/fb mark for this year’s total with a little under 5 weeks before the next technical stop. It should be a breeze to reach the stated 5/fb target in time for the summer conferences. There are a few conferences coming up over the next three weeks that could be opportunities for the experiments to present some early results using the 2012 data at 8 TeV. In particular Recontres de Blois opens on 27th May and Physics at LHC begins in Vancouver on the 4th June. However we may need to wait for the big ICHEP conference in Melbourne where they should be able to add about 5/fb from this years data at 8 TeV to last years similar total at 7 TeV. 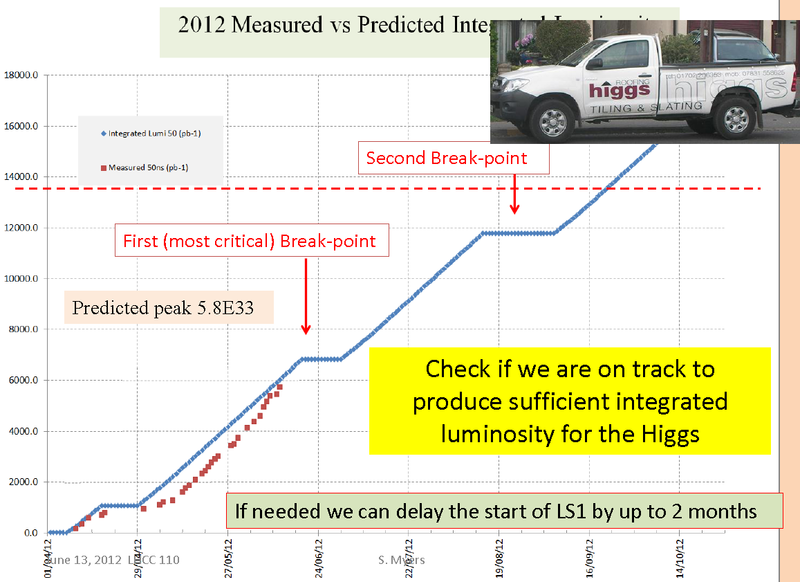 This looks likely to be a watershed moment for the Higgs search with a likelihood of at least an unofficial discovery moment if the combined significance exceeds 5-sigma (it is currently around 4.2 sigma) There is even the possibility that one of the two experiments could pass the discovery threshold with the diphoton decay mode. It depends on how lucky they are with the stats. There is also the possibility that this years data will tell a different story from last year and we will be left waiting for the full year’s dataset to complete the story. Whichever way it goes the ICHEP conference is billed as a historic moment for the Higgs boson, and it is just seven weeks away. You are currently browsing the archives for the ICHEP category.